Happening tonight from 23:59 local time for 24 hours. Link in the text. It's all about the time. "Slow TV" for the uninitiated can be something of a misnomer. 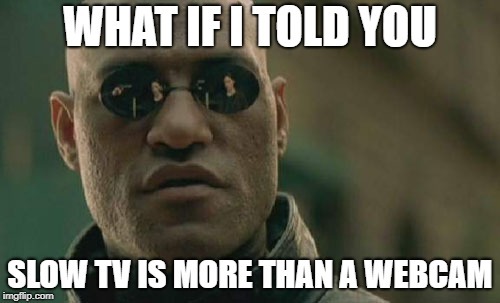 Slow TV is about TV being in real time. Not about jump cuts, accelerated narratives. Real time. Time's about to get as real time as it can for Norwegian Slow TV. 24 hours of a life-size digital clock, continuously re-assembled telling the time each minute. Imagine the cumulative drama as the clock time increments during 21st March and builds through the evening. Compelling temporal narrative. You know how it will go. You can watch via NRK's linear TV signal inside Norway, or via the livestream and chat at nrk.no/klokken. This begins at 23:59 local time on 20th March, concluding 24 hours later on 21st March. If you thought Slow TV was just a TV show, it can become a portal to a reflection on the very nature of time, an absorbing linear journey or experience, an exercise in being present in the moment. Thinking about this relatively short Slow TV (a humble 24 hours compared to the record-breaking five day Hurtigruten ferry journey, or the Svalbard Slow TV currently in pre-production) it should provide a very real, experiential and active contemplation of the nature of time and Slow TV. 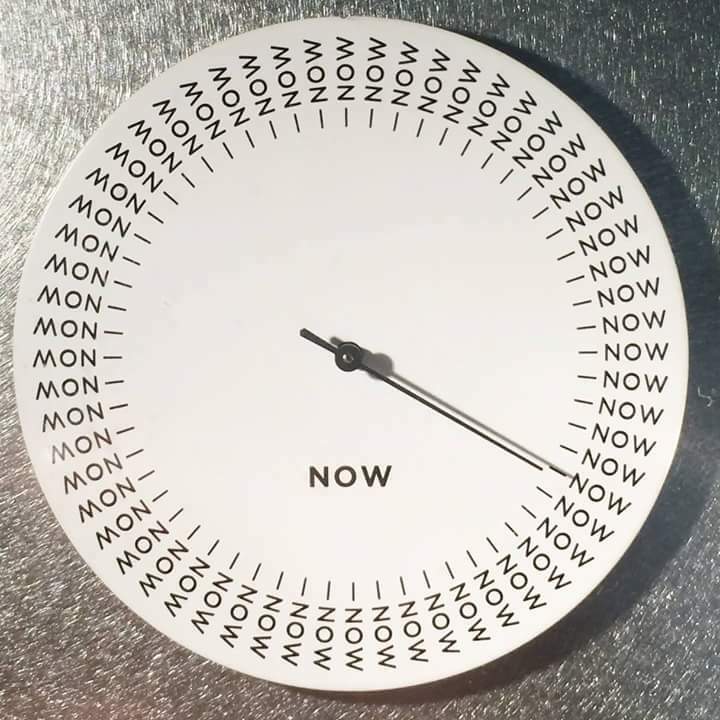 It's time to watch the clock. Very literally. The documentary - "That Damned Cow - Just What is Norwegian Slow TV?" is available to watch in full on Facebook Video now. New to The Slow TV Blog? See The Slow TV Blog media centre. NRK's record-breaking five day Slow TV broadcast aboard Hurtigruten looks set to be well and truly smashed this year as the Norwegian state broadcaster announces a major new project. Svalbard Minutt for Minutt (Minute by Minute) will be filmed in August 2019 but NOT transmitted live, owing to significant issues with the signal. NRK usually finds a way to work around these issues, such as triangulating signals with staff on nearby mountain tops to get the signal out of fjords and topography which blocks signals from the ground. As an idea in gestation since 2011, you can be sure it's been thought around and researched - so instead, it will be broadcast continuously over nine days in February 2020 to mark the centenary of Svalbard's treaty incorporating it into Norway. With the midnight sun still giving 24 hours of working light each day there should be a glorious glow for a sustained 'golden hour' sunset vibe for several hours each night. At least 25 staff from NRK will be involved in the production, estimated to run at nine days, six hours and five minutes. Multiple cameras will be installed on MS Spitsbergen, one of the tour ships of the ferry operator, Hurtigruten. Hopefully the modified bough-cam with a rotating point-of-view will make a reappearance (last seen in Hurtigruten Minutt for Minutt). Drone footage will give spectacular views; all making for a multi-camera, dynamic experience but still a Slow TV journey around the entirety of Svalbard. The Slow TV Blog will be keeping an eye out for news and developments for this and other Slow TV projects over the coming year. Apologies for the break in activity in posts to The Slow TV Blog; my main laptop with most of my material to post here has been unavailable for a while, so I am working on other means to bring The Slow TV Blog up to speed again, pending a new laptop or sorting out the defunct one. My documentary - "That Damned Cow - Just What is Norwegian Slow TV?" is available to watch in full on Facebook Video now. In the days and weeks ahead I'll be adding more to the blog. And links to Slow TV of my own. Stay tuned! This is a better view of the custom Outside Broadcast Gallery, as featured in this Summer's NRK Slow TV season with Lars Monsen. You can clearly see the different camera angles with the set up on both back-packs, aerials, minus the sun screens. (See the other view here). Innovation, pushing yourself, overcoming challenges. 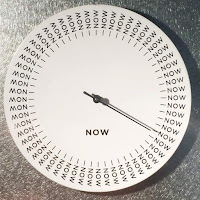 I am aware that I may be disregarding times when Slow TV can be a single camera angle or a webcam, so I am reflecting on how I show that here. 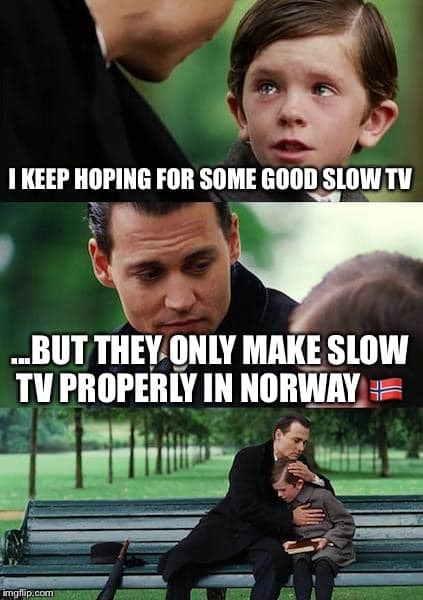 But bear in mind Norwegian Slow TV didn't get established and make Slow TV 'a thing' without lots of thought and production quality. Credit to NRK for the image. If I asked you to picture an outside broadcast gallery for allowing the curation of the best images and sound, and allowing them to be transmitted into the required media channel, you would probably picture a big truck with a long desk with faders, buttons, screens and lots of production crew standing or sliding around on rolling chairs. 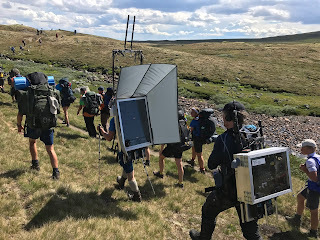 This here is the outside broadcast gallery with two backpacks for four weeks of Slow TV with Lars Monsen walking out in various Norwegian wildernesses. Especially designed and constructed for the project (and I am confident will show up for future projects). The backpack with the canopy contains the multiple video streams from different cameras allowing the producer (who often walks much closer behind) to select the image to transmit. 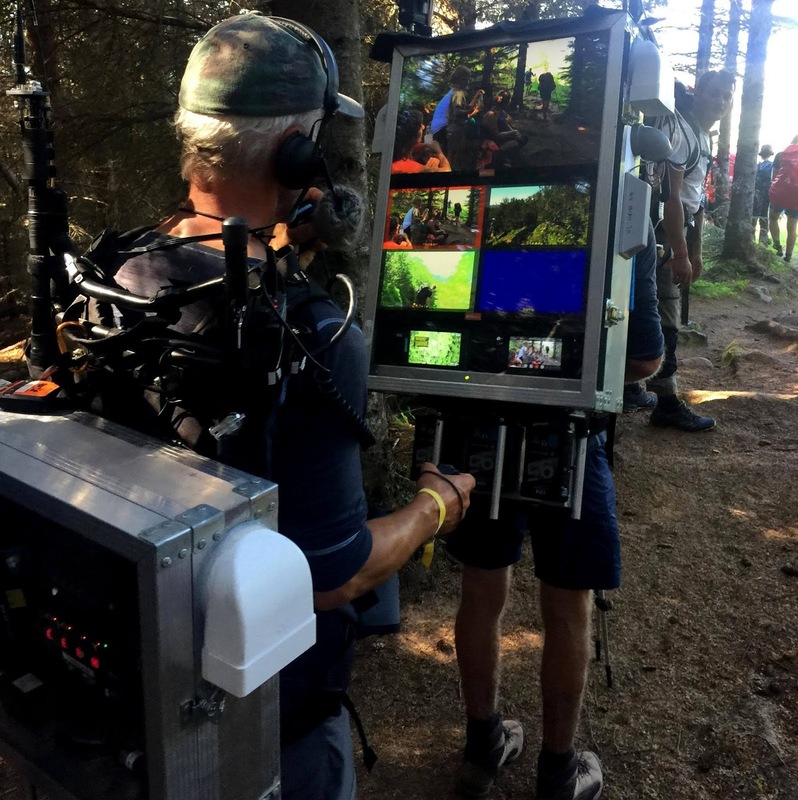 There is also the frame with aerials to transmit signals among the crew and relate the broadcast signal to triangulation transmitters on mountain tops nearby to get the images to the national TV network. The gallery backpack and producer's backpack also have vents to help keep the electronics cool and drip-pipes to allow for any condensation to exit. Norwegian Slow TV has required innovation to make it happen. We'll see much more of this backpack and ensemble in future posts. There is quite a bit of Norwegian Slow TV on Netflix. 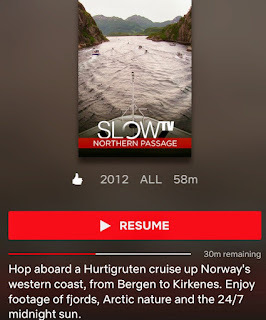 Last night's viewing: a 58 minute overview of the 5 1/4 day Hurtigruten boat broadcast where a documentary becomes a national celebration, moments of beauty, joyful tears, thousands of uninvited but welcome participants, a phone call from the prime minister, a wave from the Queen of Norway, and a culmination in the fullest epic sense. This is one of the behemoths of Slow TV, if you get your head and heart around this, you'll get to love Norway and understand Slow TV a bit better. When you know "Slow TV" by the qualities which established it, it's a frustrating thing to see it understood by so many as a single camera production, and that only. Simple productions outside Norway offering less than the Norwegian high quality production and projects, give an unevenly weighted perception that anything with a camera on something for a long time is 'Slow TV'. And if you don't like webcams or long single views, then Slow TV must be really boring, really cheap and not require much effort. Sometimes something very simple and cheap may gain dynamics of Slow TV. But Slow TV, well made, correctly framed in its story (yes, there is a story), has in its production quality something worthy of a major national or international event with the calibre to attract a massive audience. Really, really. The Norwegians who create the shows which came to be called "Slow TV" require many people to make their productions, multiple cameras, technological innovation and challenges. When Slow TV is given the proper treatment, it attracts an audience which cares about the subject, it relates a story, has moments of stunning beauty, has times of being mundane, but it can have such a sense of an epic journey which compels (the ferry journey and reindeer migration spring to mind). I'll be posting many pictures over some indefinite time ahead with a short paragraph to demonstrate that Slow TV is More Than a Webcam #MoreThanAWebcam. Prepare to adjust your perception accordingly and come down the rabbit hole to a new universe of understanding and appreciation of Slow TV done properly. Back in June, NRK broadcast the complete works of Grieg as a national celebration of his music, The Soundtrack to Norway, some may feel. The timing of its transmission didn't fit well for me, so, I only caught a few minutes of it on my phone. As a lover of classical music and Slow TV, this was disappointing - anyway, here are a couple screenshots from those couple minutes. If you would like to comment on the project or give some information about the pictures and piece being performed here, please get in touch. A short interview on BBC Radio Wales about Slow TV in general ahead of the Visit Mid Wales #realmidwales livestreams on Facebook. And so it has begun. The NRK Summer 2018 Slow TV schedule with Lars Monsen - this year it's live hiking in a number of Norwegian wildernesses. I love this stuff. Slow TV as only NRK do. More about "the how" tomorrow. 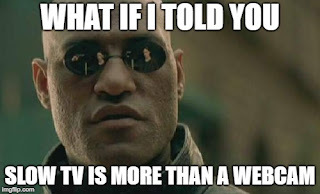 Over the next four weeks there will be live TV shows in the daytime. In the evenings, it becomes summertime from places on the road, in the same way as in previous years. It will be Slow TV during the day and show with guests, artists and audiences in the summertime in new places every night. Watch the transmission over the internet HERE. Once more NRK stretches Slow TV to something new, pushing broadcasting boundaries. The project manager is again Thomas Hellum, who has been at the centre of slow television, both by train and boat so far. And now by hiking. Earlier in 2018, understating the task Thomas Hellum points out, "To transmit directly, minute by minute, from mountain areas where barely mobile coverage is mildly challenging". Thursday 12.7: Monsen goes from Dyranut to Stigstuv. Friday 13.7: Monsen goes from Stigstuv to Rauhelleren. Saturday 14.7: Monsen goes from Rauhelleren to Heinseter. 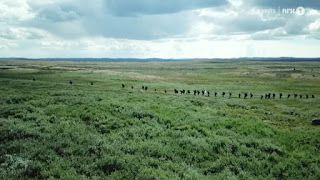 Sunday 15.7: Monsen goes from Hein to Tuva. Wednesday 18.7: Monsen goes from Bøvertun to Sognefjellshytta. Thursday 19.7: Monsen goes from Sognefjellshytta to Fannaråken. Friday 20.7: Monsen goes from Fannaråken to Skogadalsbøen. Saturday 21.7: Monsen goes from Skogadalsbøen to the tent camp in the Flesdal valley. Sunday 22.7: Monsen goes from Flesdal to Øvre Årdal. Wednesday 25.7: Monsen goes from Nyksund to Stø over the mountain. Thursday 26.7: Monsen goes from Stø back to Nyksund along the coast. Friday 27.7: Monsen crosses Breitinden to Guvåghytta. 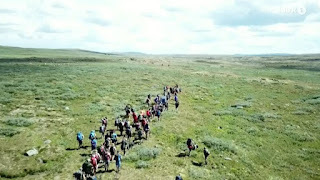 Saturday 28.7: Monsen crosses Lynghaugtinden to the tent camp at Korselva. 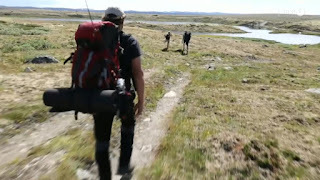 Sunday 29.7: Monsen goes from the tent camp at Korselva over to Bø. Wednesday 1.8: Monsen goes from Rostadalen to the tent camp in the Isdalen valley. Thursday 2.8: Monsen goes from Isdalen to Gappohytta. Friday 3.8: Monsen goes from Gappohytta to Goldahytta. Saturday 4.8: Monsen is a day trip from Goldahytta to Treriksrøysa. Sunday 5.8: Monsen goes from Goldahytta to Gálggojávri. Above information shortened from the main NRK post (in Norwegian) HERE. Norwegian Tourist Board information (in Norwegian) HERE. Many thanks to livnomes on Instagram for bringing this Slow TV project to The Slow TV Blog's attention, and also to Albert Solberg, also on Instagram for reminders. Broadcast starts this evening, 15th June, 17:30 CET / 16:30 BST. Official website in English at this link, show page at this link and official Facebook event page here. 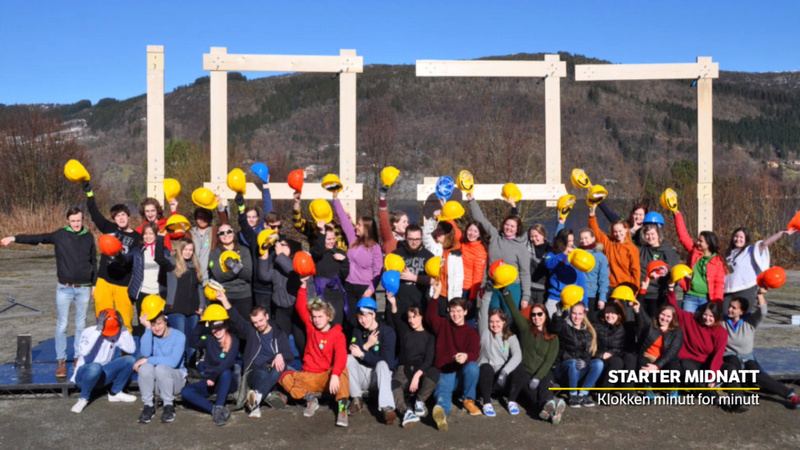 The countdown to NRK's Grieg Slow TV has well and truly begun. What will be the celebration of a composer with national resonance, "the soundtrack to Norway", is live on Norwegian TV on June 15th. 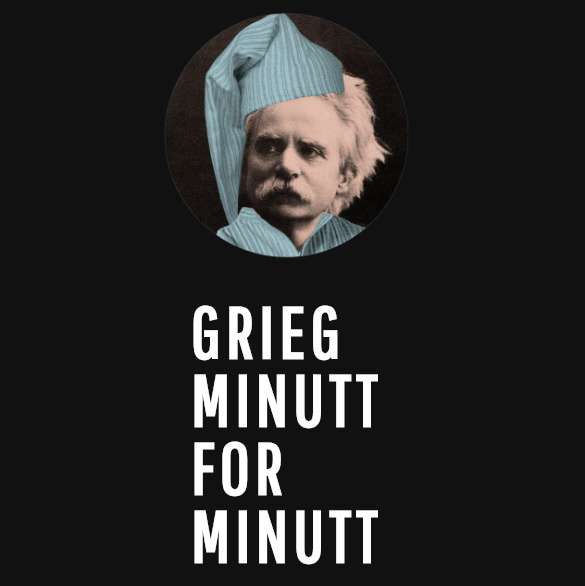 "Grieg Minutt for Minutt" translates as "Grieg Minute by Minute" and will be a chronological progression through all of Grieg's 74 opuses. A detailed breakdown of each opus is on the official event website. If you're thinking "THIS CAN'T BE SLOW TV! IT ISN'T A PRETTY PICTURE! ", Slow TV isn't just about a pretty picture. It's about taking the time it takes to show something in its own pace, in full. If that includes a pretty picture, well, that's nice. But it's also about a sense of completeness and allowing the subject to be in its own pace. If that's racing car quick for Formula 1, or snail slow for snail racing, its appropriate for the innate pace of a Slow TV subject. "Grieg minute by minute - this year's big TV event! June 15, 2018, it is 175 years since Edvard Grieg was born. We mark the day with the world's longest Grieg concert, 30 hours live on NRK! A classical music festival in Bergen! Grieg minute by minute is an outstanding opportunity to experience Grieg's production from opus 1-74, performed by the best of Norwegian music life. Troldhaugen, Edvard Grieg's home, will be open throughout the event and a center for the big crowd party. There are also great events and experiences in Grieghallen, with Bergen Philharmonic Orchestra, choirs and other musicians. The Broadcasting Orchestra also contributes great music from Store Studio. Perhaps there will be touches from other parts of the country too! What you now see on the website is just the beginning - a taste bite. The list of artists and Grieg opus numbers is updated continuously. The program runs from the afternoon of 15 June until midnight 16 June. There will be night concerts in the Grieghallen, 24 hours a day at Troldhaugen and a folk party all summer night. Do you want a night of Peer Gynt in the Grieghallen, have breakfast at Troldhaugen with the wonderful cello sonate or experience the string quartet in the gray light at Nordåsvannet?" Extensive and developing information on the performers in NRK Grieg is here. The Full Works Concert indeed... NRK Grieg is announced. In April, NRK broadcast a Slow TV focused on a day in the life of Oslo Opera House; lots of good music, public participation, flag waving and no doubt, a warm up and test run for Grieg Minutt for Minutt, coming up on June 15th. 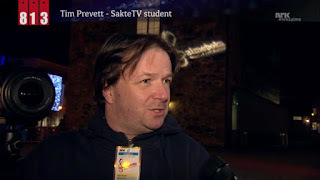 All images from and courtesy of NRK.